Whoa! I think I’ve been missing out. Is this what the author of the popular “Moreno brothers” series writes?!! While I realize this one isn’t from that series, I’d just like to say if the Morenos are anything like “Noah”, I am in for some fun! I’m a little red-faced to admit this, but the cover sold it right off the bat! After a few fantastic *fighter/boxer/UFC* romance reads, I’ve been searching for more. I love these “rough-around-the edges” heroes. The strong, silent types. I saw this announced by my author friend (thanks Tina!!) and it was an immediate buy for me. And judging this book by it’s cover worked out great, ’cause by the time I hit the middle, I knew I was truly loving it! I *pre-squee’d* on Facebook. Yep. I know, I know… I’m trying to abstain from doing that, now. ‘Cause there were a few occasions where I’ve felt the need to take my *squee* back when the book didn’t turn out to be all that. But THIS one, I already knew was a sure thing. Maryse’s Book Blog: I think it’s safe to say I’m SO into this one, and I doubt that will change now —> I LOVE NOAH!!!!!! 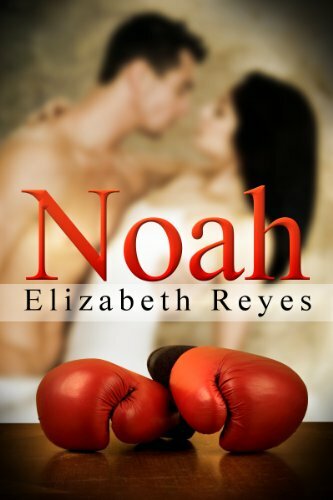 (Elizabeth’s Reyes’s Noah – the boxer guy). OMG I’m in it 50-something percent and am HOOKED. Forced myself to go to sleep at 5am!! Now, it’s “typical” and all of that, but there’s just something about how she wrote him, and the little issues, and the temptation, and the resistance. It ALL works, I’m FEELING it, and I LOVE ’em. HIM. Krystal: i lovedddd Noah by elizabeth reyes!!!!!!!!!!!!! can’t wait till the next one comes out !!! Maryse’s Book Blog: Me too. NOW I have a crush again!! Sandra: Noah was just what we girls needed….seriously. Michelle: I’m reading Noah now love it! Gitte: I LOVE this book!!!! Just what I needed! Corrina: Finished it last night, couldn’t put it down. Didn’t know I’d like it as much as I did, due to the age diff 🙂 But low and behold I loved it!!! Melanie: I really loved Noah. I ended up staying up all night to read it in one sitting. Definitely looking forward to the next on in this series. Nancy : Oh my…looks like you girls have helped me find my next reading material. Thank you!! I know “officially” (as per the synopsis) the biggest problem the main potential couple faced was the age difference, but there were plenty of other valid reasons for their issues that I just sorta… shrugged off the age issue. In reality (at least to me), it barely mattered considering they were both in their 20’s anyway, but in this case, to the heroine, it was definitely an issue. So what’s it about? Late 20’s Veronica, slightly overweight and seriously depressed after the recent death of her mother, is encouraged by her best friend, to come out of her self-induced prison. Not only did her mother’s death drain her physically, it had also taken her spirit. She was no longer the vibrant young woman full of goals and ambitions she once had been. They decide first, to work off that extra weight. At the gym (where they have free passes), Veronica (Roni) meets Noah, her trainer. Noah and his crew don’t think much of the girls at first (just average nice, older women and all that). But what makes them stand out is that this is mostly an all-guy gym for boxers in training. And as Veronica keeps coming back to continue her work-outs, Noah and her forge a friendship. Noah is proud of her progress, and Roni is smitten. And then… Noah’s roof has issues, and he needs a temporary place to stay. Well… what do you know! Veronica has TWO spare bedrooms!! Of all the luck! LOL! Ahhhh and it just keeps getting better from here on out. “I have two spare bedrooms in my home. You’re more than welcome to stay in one until you get your roof patched up.” Noah was speechless but made sure she didn’t notice how shocked he was about her offer. He remembered how horrified she’d been when she found out how old he was. Now, I’m not saying that this is my new favorite (those are hard to beat because they had me in an emotional uproar). What I am saying is that this has a good chance of making my best of 2012 list. While the story may have been “done before” and have the usual relationship struggles, the author did this one just right. I believed the heroine’s concerns when it came to falling for Noah (he’s gorgeous, much younger, surrounded by groupies because he’s an up and coming boxer etc etc…). I didn’t doubt her for a minute. And his reactions to her? Authentic. His tentative behavior, and yet still rushing to mark his territory. His jealousy issues. THEIR jealousy issues. His friends, her friends… there’s life outside of “them”, but their entourage only served to help intensity their situation. In a good way, or bad way? I won’t say. Just that it all fits. “Sure does!” What was she doing? This wasn’t playful this was flirting, something she’d always done so naturally. She needed to stop. “Especially the salty stuff.” Too much! Too much! That wiped the smirk right off his face and his dark eyes stared at her now. I just finished it too. Btw thanks for the recomendation. I also never read the moreno brothers, but if Noah is indication of her alpha males then i’m really going to give it try, that’s because lately i haven’t been in the mood for YA books. They always the same. Bu this one was so good, that i’ll look for them. Yeah i was also looking for that guy besides the KA alphas i read this year. And i wasn’t finding… But Noah totally made it. Yay Carla!! Right on the YA, I like it but in smaller doses I suppose. And you are so right, I just couldn’t imagine Noah that young, no matter how hard I tried. Mind you, I didn’t try all that hard. hehehe!! Thank you Catherine. I’m anxious to start ’em too! Thanks for the tip. I just downloaded it to my kindle.